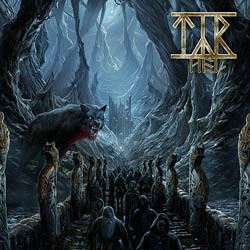 On March 8th, 2019 the Faroe Islands’ Týr will release their eighth full-length, “Hel” via Metal Blade Records. ”Hel” is a collection of ruthlessly melodic and irresistibly compelling progressive folk metal that will immediately resonate with any who have followed the band at any point over the two decades of their storied career. With “Hel” Týr provide even more irrefutable evidence that they stand at the vanguard of Scandinavian metal. Known for their prolific nature, dropping their first five full-lengths in the space of just seven years, the six-year gap between “Valkyrja” (2013) and “Hel” is by far the longest between any two of their records.